KOSMITIS HOTEL is an A' class complex that occupies an extremely preferential site of the island of Paros, as it is built right on the magnificent beach of Agii Anargyri. Located at this superb summer resort, at a distance of only 300 meters from the famous settlement of Naoussa, the hotel complex is very close to the cosmopolitan center of the island and at the same time at a beautiful natural site. KOSMITIS HOTEL, which follows the traditional Cycladic architecture, apart from being a tailor-made lodgement, is also a functional complex, ideal for your accommodation. The comfortable and fully equipped units, the qualitative and integrated facilities, as well as the hospitality of the management and the personnel guarantee that your stay at the KOSMITIS HOTEL will be an unforgettable vacation experience. 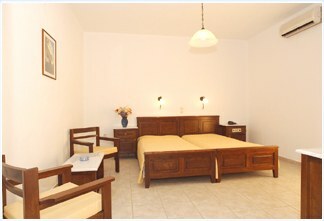 We have spacious rooms for 2, 3,4 and 5 persons, with private verandas, music, TV set, refrigerator and telephone. Most of them have straight view to the sea and the wonderful sunset. Telephone and fax, e-mail, car and moto rental service, daily cruises to other islands, sailing cruises, horseback riding, can offer you the chance of having best holidays, in the friendly, familiar environment of Kosmitis Hotel. Είστε ιδιοκτήτης ή διευθυντής στο KOSMITIS HOTEL; Εγγραφείτε τώρα για δωρεάν εργαλεία, που μπορείτε να χρησιμοποιήσετε για να βελτιώσετε την καταχώρησή σας και να συνδέσετε την ιστοσελίδα σας και το σύστημα κρατήσεών σας.